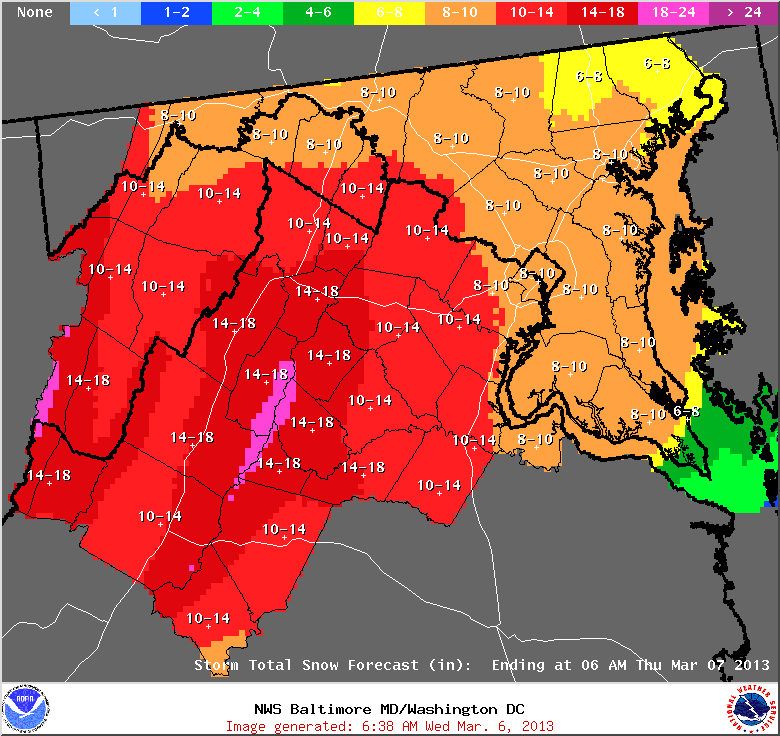 The system impacting the Washington, DC area is expected to deepen (strengthen) significantly through the rest of the day, with many now calling for accumulations in the range of the “major impact scenario” I outlined in yesterday’s post. I personally think the below estimates from the National Weather Service (NWS) are overdone, but wanted to give an idea of what the upper limits are. Some areas will achieve totals in the range outlined by the NWS, but it will depend on where the heaviest bands of snow establish themselves. I still have confidence in the accumulation totals I forecasted yesterday morning, but the upper bounds are more likely and Prince Georges has the best chance to exceed expectations. To avoid contributing to what is likely going to be a very dangerous evening commute, I would recommend working from home for those who can. Given the heavy weight of this wet snow, power outages will be likely in areas that receive 6+ inches. Two noteworthy safety concerns: 1) Driving conditions will deteriorate throughout the day, 2) shoveling snow is a known trigger for heart attacks.